The Malibu Stealth 14 kayak comes in at 14 feet 4 inches with a running depth of 12 inches and is 33 inches wide. The Stealth 14 weighs roughly 64 pounds unrigged and probably weights a good 80 pounds after throwing on some Stealth Quick Release rod holders, milk crate, fish finder and battery. This kayak can fit up to two people on it and has a surprising max capacity of 550 pounds. It also has tons of storage which will come in handy for those long treks. One of the coolest parts of this kayak is the built in live well. No more paying those crazy prices for a Hobie live well or making a home made live well one. 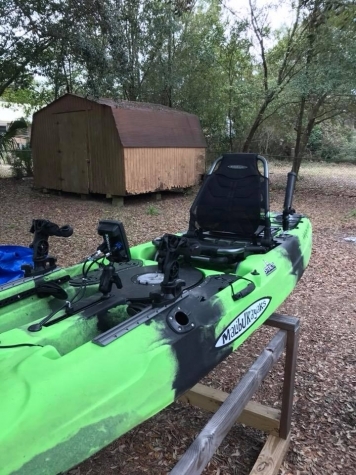 This kayak has one built in and works like a champ. Probably the best upgrade that Malibu did to the Stealth 14 was the seat. It’s a high back seat with several adjustments for max comfortability. It also has three lumbar adjustments and a fully adjustable back with a low / high position. Plus it has a sight casting leaning post which will make things ten thousand times easier on the back and help with spotting cobia and mahi offshore and tailing red on the flats. Being 33 inches wide the Stealth is super stable so leaning back on a long day should be very easy and safe. It comes in 15 different colors and cost around $1699 MSRP. Below a video of American Yaker Justin Rabon going over in detail about the new Malibu Stealth 14. Check out our guide on rigging up your own offshore fishing kayak!